Station is at St. Chrysogonus’ Church in Trastevere across the Tiber. This was the titular church of Pope Leo XIII when he was still a Cardinal. St. Chrysogonus is one of the saints invoked in the Canon of the Mass. Until Maundy Thursday, in masses of the season, the Psalm Judica me Psalm 42 is omitted as well as the Gloria Patri after the Introit and the Lavabo. The Basilica of St. Chrysogonus in Trastevere, near the classical guard-house of the Vigiles, still preserves under the sanctuary the remains of the dwelling-place of the martyr of that name, which dates back to the time of Constantine. In the Prayer we ask two things of God: firstly, that He would so sanctify our lenten fast that our interior dispositions may harmonize with our bodily abstinence; and, secondly, that our penitence and contrition of heart may obtain for us the pardon of our past shortcomings. [For the Epistle]The Church’s intention in this day’s lesson is to encourage us to earnestness and perseverance in our penance. Here we have an idolatrous city, a haughty and debauched capital, whose crimes have merited the anger of Heaven. God threatens it with His vengeance: yet forty days, and Ninive and its inhabitants shall be destroyed. How came it, that the threat was not carried into effect? What was it that caused Ninive to be spared? It’s people returned to the God they had left; they sued for mercy; they humbled themselves, and fasted; and the Church concludes the prophet’s account by these touching words of her own: ‘And the Lord our God had mercy on His people. They are Gentiles, but they became His people, because they did penance at the preaching of the prophet. God had made a covenant with one only nation, the Jews; but He rejected, not the Gentiles as often as they renounced their false gods, confessed His holy name and desired to serve Him. We are here taught the efficacy of corporal mortification; when united with spiritual penance, that is, with the repentance of the heart, it has power to appease God’s anger. How highly then, should we prize the holy exercises of penance, put upon us by the Church during this holy season! Let us also learn to dread that false spirituality, which tells us that exterior mortification is of little value: such doctrine is the result of rationalism and cowardice. [For the Gospel] The enemies of Jesus sought to stone Him to death, as we were told in yesterday’s Gospel; today they are bent on making Him a prisoner, and send soldiers to seize Him. This time Jesus does not hide Himself; but how awful are the words He speaks: “I go to Him that sent Me: you shall seek Me, and shall not find Me!” The sinner, then, who has long abused the grace of God, may have his ingratitude and contempt punished in this just, but terrific way – that he shall not be able to find the Jesus he has despised: “he shall seek, and shall not find.” Antiochus, when humbled under the hand of God, prayed, yet obtained not mercy (2 Maccabees ix: 13). 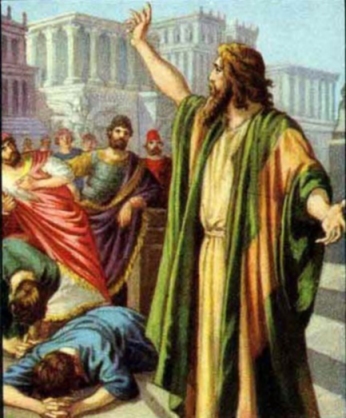 After the death and resurrection of Jesus, whilst the Church was casting her roots in the world, the Jews, who had crucified the just One, were seeking the Messiah in each of the many imposters, who were then rising up in Judea, and fomenting rebellions, which led to the destruction of Jerusalem. Surrounded on all sides by the Roman legions, with their temple and palaces a prey to flames, they sent up their cries to Heaven and besought the God of their fathers to send, as He had promised, the Deliverer! It never occurred to them that this Deliverer had shown Himself to their fathers, to many even of themselves; that they had put Him to death, and that the apostles had already carried His name to the ends of the earth. They went on looking for Him, even to the very day when the deicide city fell, burying beneath its ruins them that the sword had spared. Had they been asked what it was they were awaiting, they would have replied that they were expecting their Messiah! He had come, and gone. “You shall seek Me, and shall not find Me!” Let those, too, think of those terrible words of Jesus, who intend to neglect the graces offered to them during this Easter. Let us pray, let us make intercession for them, lest they fall into that awful threat, of a repentance that seeks mercy when it is too late to find aught save an inexorable justice. But what consoling thoughts are suggested by the concluding words of our Gospel! Faithful souls, and you that have repented! listen to what your Jesus says, for it is to you that He speaks: “If any man thirst, let him come to Me and drink.” Remember the prayer of the Samaritan woman: Give me, O Lord, to drink of this water! This water is divine grace: come and drink your fill at the fountains of your Saviour, as the prophet Isaias bids you (Isaias xii: 3). This water gives purity to the souls that are defiled, strength to them that are weak, and love to them that have no fervour. Nay, our Saviour assures us that he who believes in Him shall himself become a fountain of living water, for the Holy Ghost will come upon him, and he shall pour out upon others of the fullness that he himself has received. With what joy must the catechumen have listened to these words, which promised him that his thirst should soon be quenched at the holy font! Jesus has made Himself everything to the world He has come to save: Light to guide us, Bread to nourish us, a Vine to gladden our hearts with its fruit, and, lastly, a Fountain of living water to quench our thirst. Sanctify our fasts, we beseech Thee, O Lord and in Thy mercy grant us pardon for all our sins. Through our Lord Jesus Christ, Thy Son, Who liveth and reigneth with Thee in the unity of the Holy Ghost, one God Forever and ever. R.Amen. We beseech Thee, O Lord, mercifully to receive the prayers of Thy Church : that, all adversity and error being destroyed, she may serve Thee in security and freedom. Through Jesus Christ our Lord, Who liveth and reigneth with Thee in the unity of the Holy Ghost, one God Forever and ever. R.Amen. And the word of the Lord came to Jonas the second time saying: Arise, and go to Ninive, the great city: and preach in it the preaching that I bid thee. And Jonas arose, and went to Ninive, according to the word of the Lord: now Ninive was a great city of three days’ journey. And Jonas began to enter into the city one day’s journey: and he cried and said: Yet forty days and Ninive shall be destroyed. And the men of Ninive believed in God: and they proclaimed a fast, and put on sackcloth from the greatest to the least. And the word came to the king of Ninive: and he rose up out of his throne, and cast away his robe from him, and was clothed in sackcloth, and sat in ashes. And he caused it to be proclaimed and published in Ninive, from the mouth of the king and of his princes, saying: Let neither men nor beasts, oxen, nor sheep taste anything: let them not feed, nor drink water. And let men and beasts be covered with sackcloth, and cry to the Lord with all their strength, and let them turn every one from his evil way, and from the iniquity that is in their hands. Who can tell if God will turn, and forgive: and will turn away from his fierce anger, and we shall not perish? And God saw their works, that they were turned from their evil way: and God had mercy with regard to the evil which he had said that he would do to them, and he did it not. O God, hear my prayer: give ear to the words of my mouth. Save me, O God, by thy name, and judge me in thy strength. He hath not dealt with us according to our sins: nor rewarded us according to our iniquities. V. (Psalm 78. 8, 9) Remember not our former iniquities: let thy mercies speedily prevent us, for we are become exceeding poor. Help us, O God, our saviour: and for the glory of thy name, O Lord, deliver us: and forgive us our sins for thy name’s sake (Here kneel) Help us, O God, our savior : and for the glory of Thy Name, O Lord, deliver us : and forgive us our sins for Thy Name’s sake. The Pharisees heard the people murmuring these things concerning Him: and the rulers and Pharisees sent ministers to apprehend him. Jesus therefore said to them: “Yet a little while I am with you: and then I go to Him that sent Me. You shall seek Me and shall not find Me: and where I am, thither you cannot come.” The Jews therefore said among themselves: Whither will He go, that we shall not find him? Will He go unto the dispersed among the Gentiles and teach the Gentiles? What is this saying that He hath said: You shall seek Me and shall not find Me? And: Where I am, you cannot come? And on the last, and great day of the festivity, Jesus stood and cried, saying: “If any man thirst, let him come to Me and drink. He that believeth in Me, as the scripture saith: Out of his belly shall flow rivers of living water.” Now this He said of the Spirit which they should receive who believed in Him: for as yet the Spirit was not given, because Jesus was not yet glorified. Turn to me, O Lord, and deliver my soul: O save me for Thy mercy’s sake. Grant us, O Lord our God, that this saving victim may become the expiation of our sins, and a propitiation with Thy majesty. Through our Lord Jesus Christ Thy Son our Lord, Who liveth and reigneth with Thee in the unity of the Holy Ghost, one God Forever and ever. R.Amen. Protect us, O Lord, who assist at Thy mysteries ; that, fixed upon things divine we may serve Thee in both body and mind. Through our Lord Jesus Christ, Who livest and reignest, with God the Father, in the unity of the Holy Ghost, one God For ever and ever. R. Amen. May the saving reception of Thy sacrament, we beseech Thee, O Lord, grant us both purification and healing. Through our Lord Jesus Christ, Thy Son, Who liveth and reigneth with Thee in the unity of the Holy Ghost, one God For ever and ever. R. Amen. Bow down your heads before God. Grant to Thy people, we beseech Thee, O Lord, health of soul and body that, devoted to good works, they may ever deserve to be defended by Thy protection. Through our Lord Jesus Christ, Who livest and reignest, with God the Father, in the unity of the Holy Ghost, one God For ever and ever. R. Amen.